Tessy Thomas missile women of India profile and biography is given here. Tessy Thomas, also better know as the missile women of India or Agni Putri hails from the district, well known as the Venice of the East, Alappuzha. Tessy Thomas was born on April 1963. Her father is a IFS officer and mother is a housewife. Read the article to know more about Dr. Tessy Thomas. Tessy Thomas hails from the district, well known as the Venice of the East, Alappuzha. The district perfect in its beauty and crafted to perfection with landmarks like Backwaters of Kerala. Tessy Thomas was born on April 1963. Her father is a IFS officer and mother is a housewife. Her family being a Nasrani Syriyan Christian, named her after Mother Teresa, the late Nobel laureate and saint of Latin Church who worked with poor in Kerala. Tessy Thomas's marriage was an inter religious one with Saroj Kuma Patel who was her classmate at Pune. Saroj Kumar is a CMDR officer. He spends a long stretch of his carrier as a navy officer posted away from Hydrabad. She has a son named Tejas who is 21 years old. His name is an anagram of his mother and father and not the light combat aircraft. Tejas is looking at a corporate job after completion of his studies but he does not really rule out following his mothers footsteps into defence technologies. He was born and brought up in a defence service surrounding, as both of his parents are in defence service, so he is always fascinated by it and would even like to peruse one if he gets the opportunity. With such a professional and sophisticated lifestyle and looks one could never ever in their wildest dreams imagined her being a champ in of the sports event and that too not chess but badminton. She was a good badminton player in her school and college life and has won enough and more awards, prizes and trophies. Tessy Thomas a women who perfectly fits to the portrait of a good Indian housewife is a perfect mother, a perfect wife, a perfect neighbour and performs all the daily chores with fiancee. She juggles her professional and personal life perfectly. When if someone pictures her on the basis of her carrier then one would probably be looking out for a prissy, science sprouting, bespectacled professor, but to its contrary one would be amazed to find her so loving, caring, warm and down to earth woman. Teesy Thomas has completed her B-Tech professional degree course from Thrissur Engineering College. She was a very bright girl during her college life and was a very vibrant youth. She took part in many different inter college and intra college events and has brought laurels to her college. She also used to be active in sports and played and played badminton apart from beeing studious. She completed her college with flying colours. During her pre degree course she was also an active participant in politics at the same time she did commendable with her studies. Tessy Thomas could even have been an IAS office, she even had written the test for the same but fate had something else planned for this wonder women, it happened so that the DRDO (Defence Research and Development Organization) had their interview on the same date and she got through it. After passing her DRDO interview she got the call letter within a week saying that she had to report within two days time. Tessy Thomas was appointed by A. P. J. Abdul Kalam in Agni Missile program when she finished her M-Tech from Defence Institution of Armament Technology, Pune and that is where she has been ever since. Within a few years of her coming to the Agni team, Dr. Tessy Thomas had designed an advanced missile guiding system which was first of iymts kind in India. Inflight what ever target the missile was launched at the team was quite sure about its navigational and guiding tech that it will not miss that target. But her expertise and her part in defence world do not store here she has also developed a ground breaking technology named RVS (Re entry Vehicle System) this lets the missile re enter the atmosphere with a thundering velocity and with a temperature of three thousand degree Celsius. The real test for Tessy Thomas and her team came in July 2006, 75 seconds into the flight and the test missile suddenly went out of control but Dr. Tessy Thomas took it as a challenge and the team was able to launch that missile after a period of 10 months successfully. It was all due to the untiring efforts of Dr. Tessy Thomas. Dr. Tessy Thoma's moniker " Agni putri " or " The Missile Women of India ", hails from her works in the field of Agni 3, Agni 4, and Agni 5. She likes her title even more because her role model and mentor Dr Kalam is called the missile man of India. Tessy Thomas was associate project director for the three thousand kilometer range Agni 3 project. Agni-III is an intermediate-range ballistic missile developed by India as the successor to Agni-II and is capable of engaging targets deep inside neighbouring countries. The missile's Circular error probable (CEP) is within 40 meters range, which makes it the most sophisticated and accurate ballistic missile of its range class in the world. She was project director for the Agni 4 project that was successfully tested in 2011. Agni-IV is the fourth in the Agni series of missiles which was earlier known as Agni II prime. It has a number of new technologies and significant improvement in missile technology. The missile is light-weight and has two stages of solid propulsion and a payload with re-entry heat shield. Tessy was appointed the project director for the the five thousand kilometer range Agni 5 missile and is based at Advanced System Laboratory in Hyderabad. Agni-V is an intercontinental ballistic missile developed by the Defence Research and Development Organisation (DRDO) of India. It is part of the Agni series of missiles, one of the missile systems under the original Integrated Guided Missile Development Programme. Tessy gives the entire credit of her laurels to her family and friends who has helped and supported her all throughout. She is very thankful to her parents and her inlaws for supporting an inter religious marriage. During her project period she had left her son sick that too during his board exams but still Tejas has no complains and thinks of her mom as the best and takes her as his role model. Prime Minister Manmohan Singh told to the Indian Science Congress that Mrs Thomas is an example of a "woman making her mark in a traditionally male bastion and decisively breaking the glass ceiling". 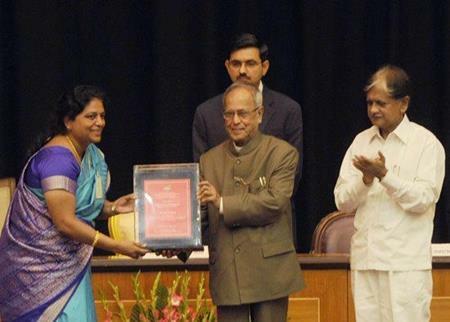 Tessy Thomas was conferred the Lal Bahadur Shastri National Award for her outstanding contribution for making India self-reliant in the field of missile technology. She is also an example for a women who is doing her best in a male dominated society of ours.